You can create a project budget, invoice time logs and, record expenses for all your projects by integrating Zoho Projects with Invoice and Books. Project managers can create budget to view the planned versus actual cost in real time. The invoice lists the products or services that are part of the sale, the price and quantity, the various taxes applied and the discounts given. You can save an invoice as a draft to be edited later. If the invoice crosses its due date, the status changes to Overdue automatically. It is important to record all the expenses to know the actual cost. 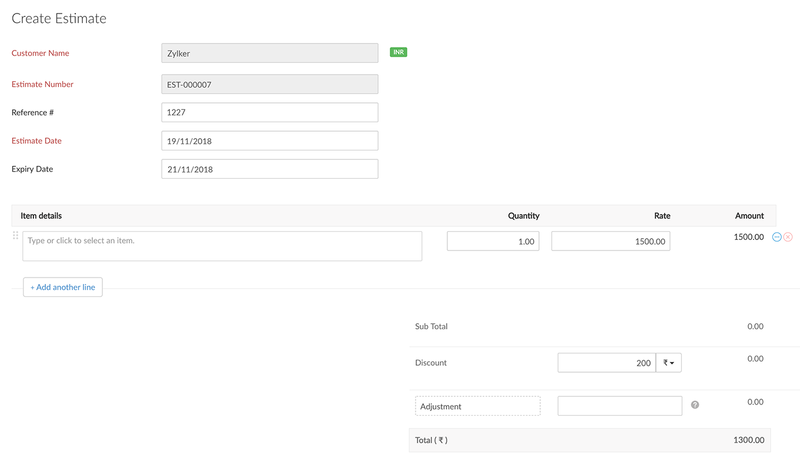 You can also generate estimates and send the quote to the customers. 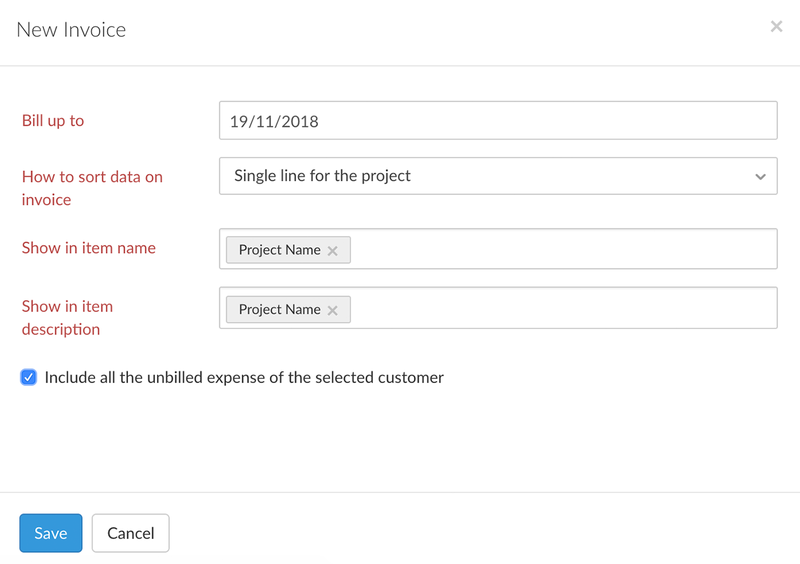 Estimate can be marked as Accepted if the customer agrees with the quote otherwise it can be marked as Declined. Fetch timesheets, contacts, tasks, users and bugs that are associated with Zoho Projects to Zoho Books. 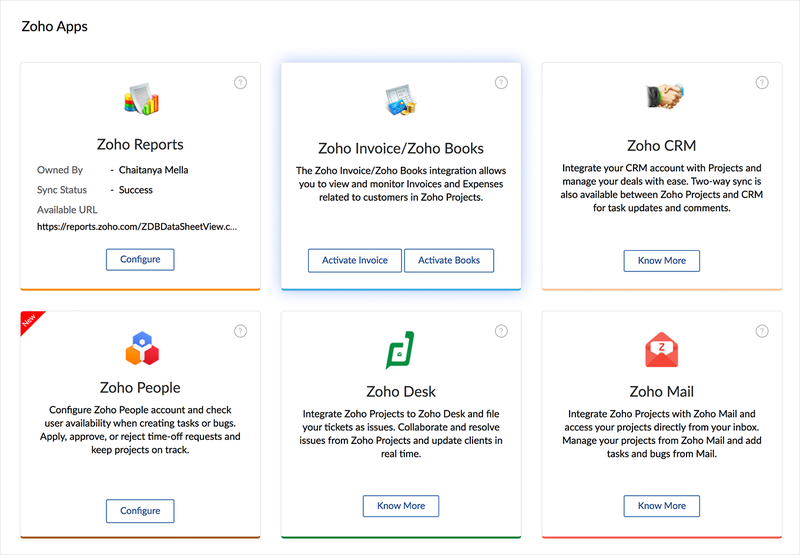 Keep a track of all the invoices and expenses by integrating Zoho Projects with Books and Invoice. Click to learn more about access privileges for integration with other Zoho Apps. 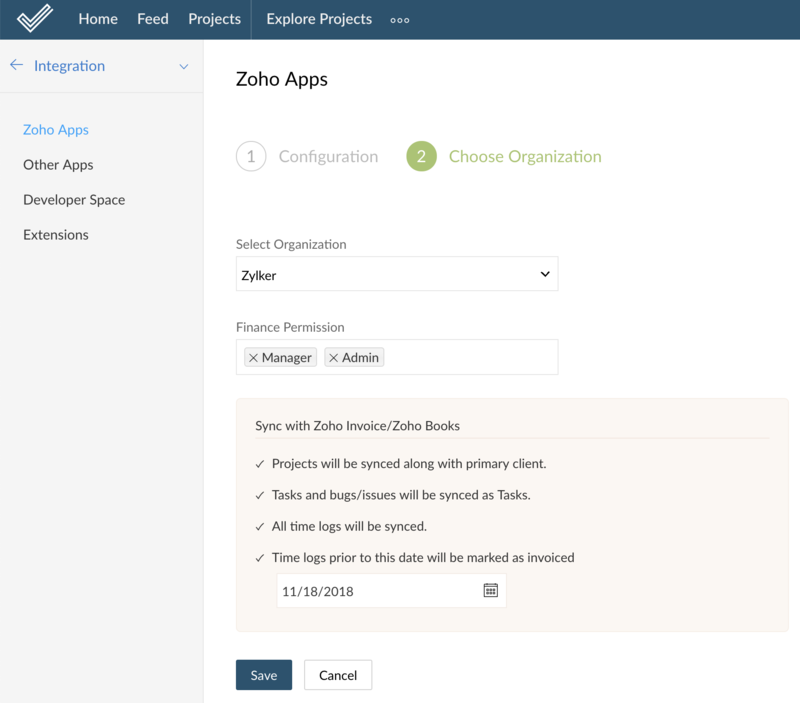 Choose Zoho Apps in Integration. Now, select Activate Invoice or Activate Books in Zoho Invoice/Books. Click How to Generate ZSC Key? to get the ZSC key. If you do not have a user account in Zoho Books or Zoho Invoice, you will be asked to create a new organization. After you have created and set up your organization, you will be directed to Zoho Invoice or Zoho Books. In Zoho Invoice or Zoho Books, in the Dashboard, click the Settings icon in the upper-right corner, and then click Integrations. Click Zoho Invoice ZSC Key or Zoho Books ZSC Key and then click Generate Now to get the new ZSC key. Copy the Email ID and ZSC key. 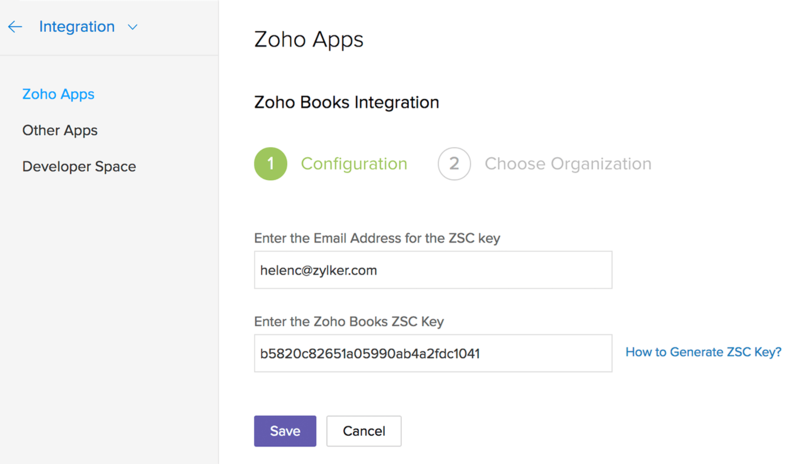 In Zoho Projects, enter the copied Email ID and ZSC key. Select the Organization, Finance Permission. Select a date from when the time logs are to be invoiced. Time logs prior to this date will be marked as invoiced. Users must be given permission to view all timesheets before they can be given the permission to access Invoice. Navigate to > Integration > Zoho Apps > Zoho Invoice/Zoho Books tile. Click in the Accessible to section. Profiles with view all timesheets permission will be listed here. Selecting a profile will give users access to the Finance tab in Zoho Projects. Budget is enabled automatically for the users integrated with Zoho Books or Zoho Invoice. Click here to learn more about budget feature. Navigate to your project and select Finance. Click Create Invoice to create the invoice for your team. The Bill up to field is mandatory in order to generate the invoice. So, select a date if you haven't selected yet. You can create invoice only for billable timesheet logs based on the selected date range. Only approved time logs will be invoiced, if the "Submit with Approval" option in your Portal Settings is selected. (To enable this: Click and select Company Profile in Portal Settings. Enable Submit with Approval in Timesheet Approval Process found in the Module Configuration section). If you have not selected the approval option, all the time logs will be invoiced. Choose the sorting criteria for the invoice. Select the fields to be shown as item name and description. Select the option Include all the unbilled expense of the selected customer option to invoice all the expenses. Fill the details and enter the recipients in the Email To field. Click Save to send the invoice to customers. All the invoices created are saved in the Finance tab. Select the required invoice to edit or delete. Click to edit the invoice details and then click Save to update the changes. 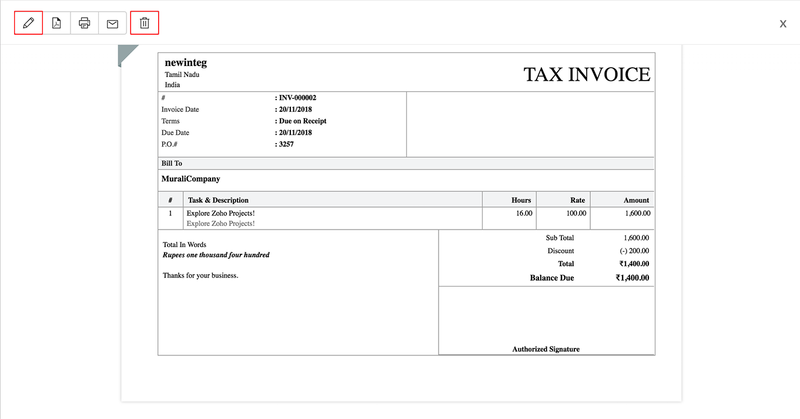 You can email or print an invoice as well as export the invoice as a .pdf file. You can filter invoices based on different criteria like void, draft, paid, and sent invoices. An Estimate is a proposal that you send to your customers with detailed quotation. After the customer accepts the estimate, it can be converted to a sales order or an invoice. Choose theEstimates tab and click Create Estimate. Click Save to send the estimate to customers. 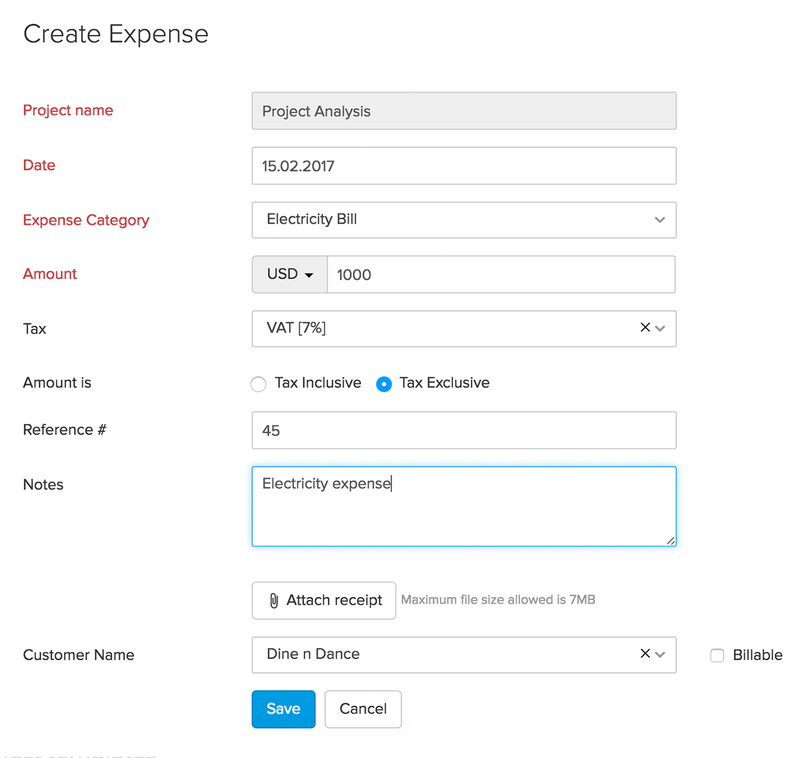 Click the Expenses tab in Invoice and Expenses, and then click Create Expense in the upper-right corner to create a new expense record. Specify the expense details and then click Save to save the expense record. All the expenses recorded are saved in the Finance tab. Select the required expense to edit or delete. Click to edit the expense details and then click Save to update the changes. Plus, you can click on the attached expense receipt to download. You can attach, change, and delete an expense receipt. 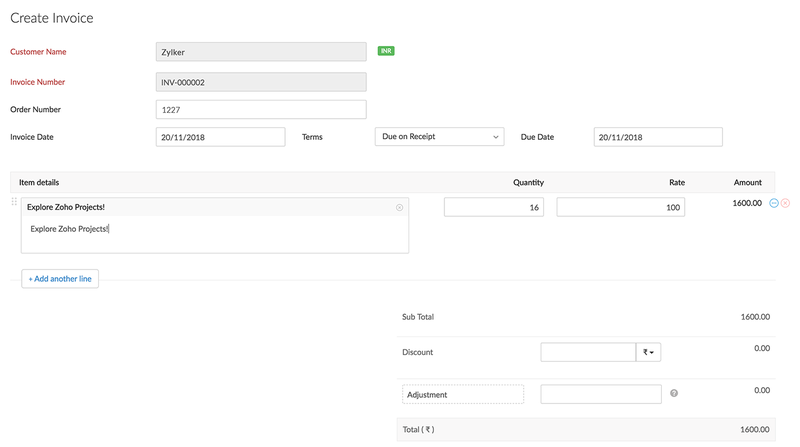 The invoice details are displayed in Timesheet, Tasks, and Bugs. Invoice created in Zoho Projects will be listed in Zoho Invoice or Zoho Books. If something goes wrong during integration you can view the error summary in Zoho Books or Invoice under Settings > Integrations > Zoho Projects > View Error Summary, which contains a module-wise list of errors that occurred.